The holiday season is made up of traditions people love. Many of those fun moments revolve on decorating the tree. There’s nothing quite like opening that first box of ornaments and sifting through the memories. This year take some time to add to your ornament collection by repurposing a common household item and turning it into a personalized treasure. When it comes to putting a personal touch on your Christmas tree, a mason jar lid and some paint transform a canning accessory into a memorable snowman keepsake you’ll treasure long after Christmas is gone. This DIY project incorporates easy to find extras from outside and indoors and even gives you the option of choosing a colorful scarf to finish off the ornament. 1. Remove the mason jar lid from the jar and separate the smaller, interior lid from the larger outer band. 2. Fill a small bowl with white paint. 3. 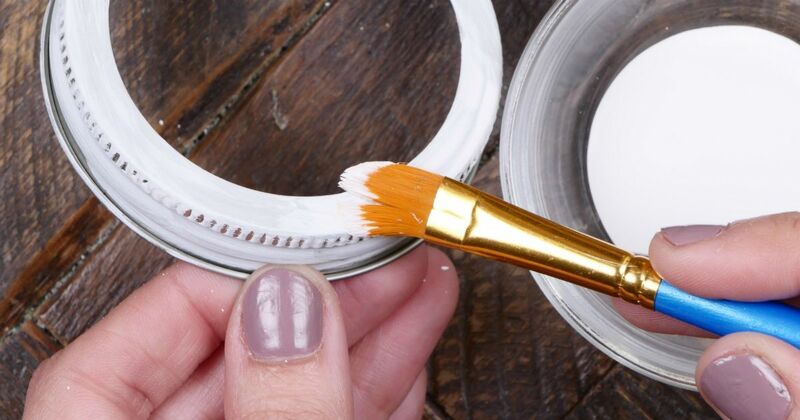 Paint the entire surface of both the small interior lid and larger outer band white. 4. Place the large outer band on a piece of wax paper. 5. Trace the circular outline of the large outer band onto the wax paper with a black permanent marker. 6. Carefully cut out the wax paper circle. 7. Place a thin line of hot glue around the entire circumference of the large wax paper circle. 8. Carefully press the wax paper glue-side down into the interior rim of the large outer band. Press to hold. 9. Put a thick line of glue on the top of the large outer band. 10. Carefully press the small lid to the line of glue on the large outer band to attach. Press to hold. 11. Cut out the shape of a snowman hat from black construction paper. 12. Attach the hat to the top and backside of the small interior lid with hot glue. This is now the head and hat of the snowman ornament. 13. Fold a narrow strip of decorative ribbon in half and make two small upward triangle cuts where the edges meet. 14. Unfold the decorative ribbon and refold around the space where the small lid and large outer band are attached. Attach the ribbon like a scarf by using a small dot of glue to keep the ends together. 15. Secure two small twigs as arms to either side of the outer band with small dots of hot glue. 16. Draw two eyes and a mouth with black permanent marker. 17. Apply a small circle of hot-glue in the center of the face and cover with 10 to 12 small red crafting beads for a sparkling, red nose. 18. Draw three buttons on the front of the large circle w ith black permanent marker. 19. Attach a small piece of red string to the back of the hat with hot glue in a half circle as a hanging device. 20. Let the ornament dry before hanging it.